Matching Tudor Details In A Berden Conservatory. Every so often we have the privilege of creating something completely unique. Although everything we design and build is bespoke, some projects are more bespoke than others. 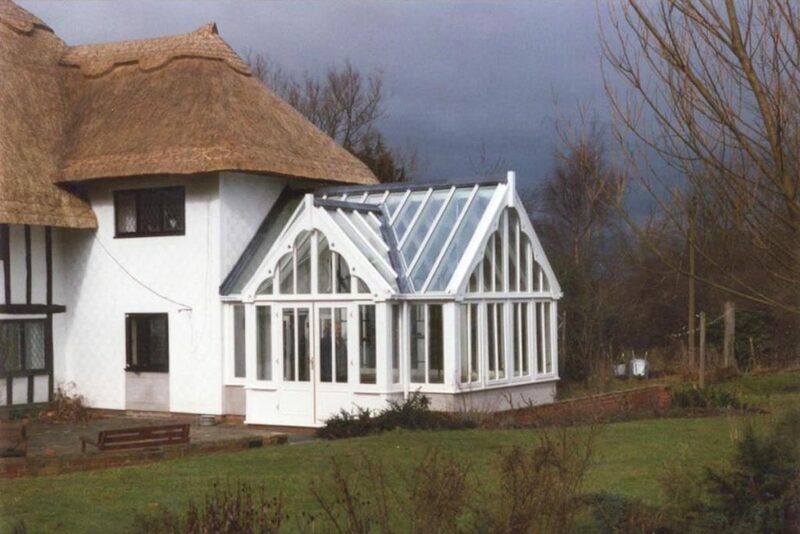 That was certainly the case with this Berden Conservatory built to add space for the owners of a stunning Tudor home. With such spectacular architecture, it was a huge, but completely delightful responsibility. We relished the challenge and are absolutely thrilled with the results. Tudor homes, while beautiful in style, are often dark inside. With old beams and original lead lighted windows, this home in Berden was no exception. Wanting a light filled space to enjoy the immediate and wider surrounds, the owners approached us to design a annexe building that would not only give them what they wanted but that would satisfy the local planners. Only the most minutely detailed conservatory would meet both the aesthetic and practical requirements for this project. Tudor architecture is the last incarnation of the Medieval era. It followed from the late Gothic Perpendicular Style which was popular until Circa 1520. 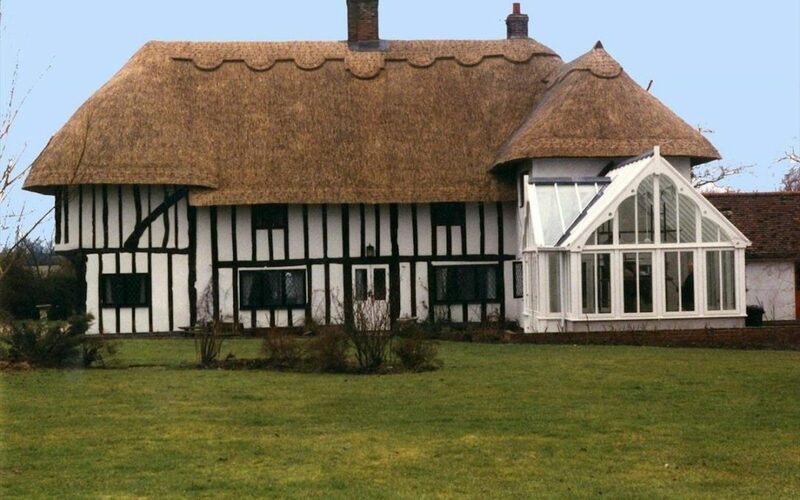 Mirroring the hipped end of the thatched roof of the home, we created a double fronted gable end conservatory that incorporates several Gothic design features. One of the most obvious details is seen on the internal curves of the gable end bargeboards. Based on the original Gothic Rose Window design which is a series of circles within circles, the internal curves are a nod to a long gone era. As are the strong vertical glazing bars which lead to a definite ridge beam that runs front to back on top of each of the gable ends. The strong vertical lines of the exposed beams that are such a stunning feature of a true Tudor home are reflected in the vertical glazing bars of the conservatory windows. 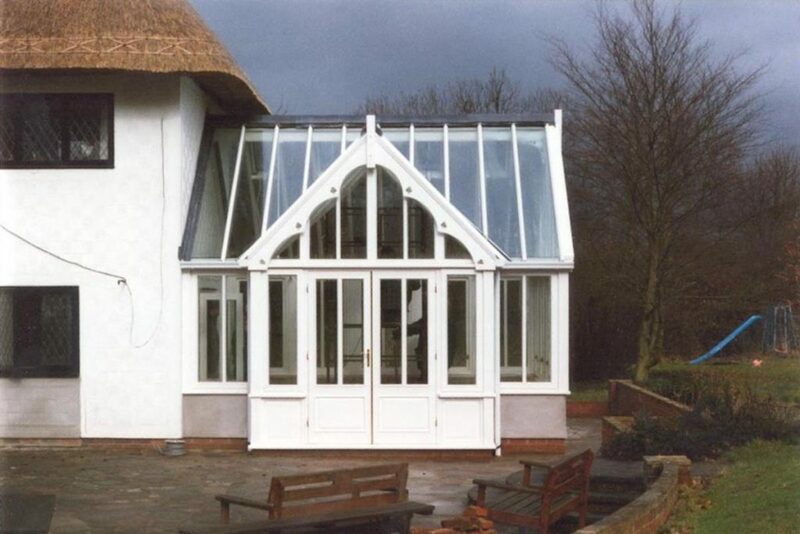 Set on a simple white rendered base, this Berden Conservatory flows perfectly from the main building and echoes back to the Gothic chapels of old. Glazed on three sides, the conservatory provides a 270 degree view of the woodlands that surround this spectacular home. And with a beautifully detailed set of French Doors offering access to a secluded patio with bench seats for enjoying sunny days, this Berden Conservatory is simply stunning!